Last year, I reviewed Contour’s RollerMouse Free, a very different type of pointing device that impressed me greatly. At the time, I didn’t understand that the Free is actually the second-generation RollerMouse. The first-generation model is called the Pro, and it is still very much available, offering features and benefits of its own. If you don’t already understand how a RollerMouse works, you might start by taking a look at my original article, as I will not be re-explaining the general principles here. Rather, the purpose of this review is to help you understand how the Pro differs from the Free, and why you might choose it. 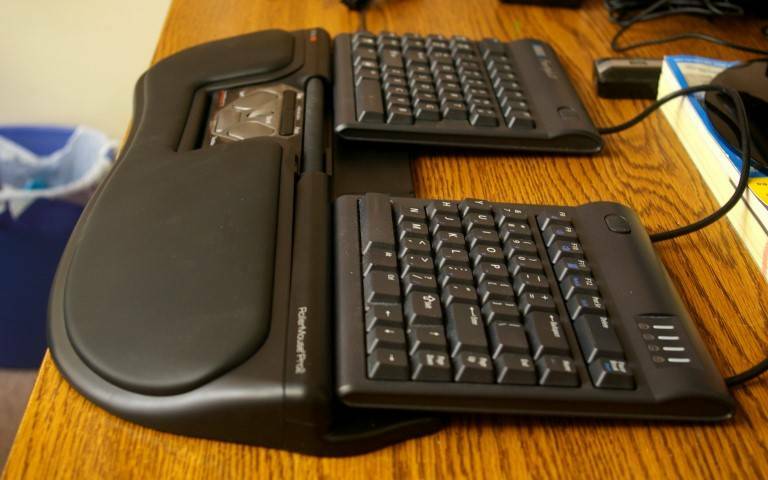 The RollerMouse Pro with the ErgoMat accessory and my Kinesis Freestyle keyboard. Who needs a RollerMouse Pro? In general, most users will likely prefer the RollerMouse Free, as it beats the older model in most respects. You might, however, prefer the RollerMouse Pro if anything on this list describes you. Your desk has a keyboard tray mounted well below elbow height. You’re in love with a standard-shape, ordinary-thickness keyboard (anything from a Dell freebie to a Das Professional) and you don’t want to give it up. You like the idea of resting your forearm on a vast island of softness called the RollerWave. You have an extremely messy environment, or frequently eat at your desk. You can’t afford $40 more for the RollerMouse Free. The RollerMouse Pro is both larger and thicker than the Free. As you might have gathered from the above, the main difference between the Pro and the Free has more to do with shape than functionality. There’s a lovely confusing comparison chart on Contour’s website, but I’ll give you a rundown on the major differences here. The Pro is thicker by about a factor of two. This is why it works well with thick keyboards, where the Free works better with thin ones. The Pro can also work with a thin keyboard, however, using the adjustable keyboard risers. This is particularly beneficial if you have a low tray, as the risers can create a nice negative tilt for your keyboard. 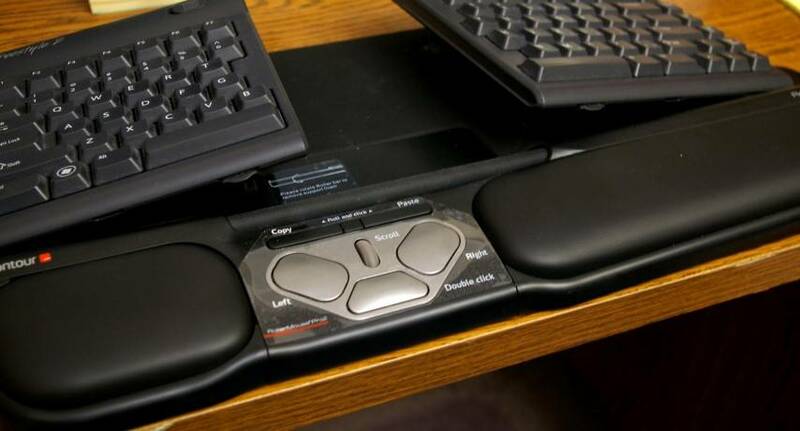 The Pro’s higher palm rest can also improve your wrist angle when using a keyboard tray. The thin palm rest on the Free is more likely to result in harmful back-bending of the wrists. Where the Free RollberBar is completely open end-to-end (cordially inviting all dust, crumbs, etc. to take up residence) the Pro rollerbar is enclosed by a plastic cover, with only six inches exposed. I haven’t used the RollerMouse Free in some time, so the following comparison may not be entirely fair. However, it is my impression that the Pro is more difficult to operate with precision. The rollerbar felt a bit more sensitive, and harder to hold steady while clicking. I also found that I was hitting the right and left limit switches more than I remember doing with the Free. Again, this is just my impression, not the result of a scientific experiment. The scroll wheel is one area where the Pro falls badly behind the Free. Where the Free scrolling action is silky-smooth, the Pro wheel emits a distressing click at every nudge, making it feel resistant and rough. This is not only annoying, but really quite tiring when you have to scroll through a long document. Pressing the wheel for middle-click is also more difficult than it should be. The keyboard is shown elevated on the risers for illustrative purposes – probably not the best real-world setup. This scroll wheel issue is illustrative of the Pro experience in general: it just isn’t as “smooth” as the Free. Another good example is the rollerbar tension control. On the Free, it’s a nice slider. On the Pro, it’s a clunky dial with five presets. Similarly, the Pro has only three settings for pointer speed, and they’re accessed by a switch on the bottom of the unit. The Free has five speed levels, and they’re easy to change using a button and indicator lights on top. I still have my old sample RollerMouse Free, but its action is not as smooth as it used to be. The rollerbar has accumulated sticky gunk and is quite dirty. Now, dirt accumulation over time is perfectly natural (especially when I’m in charge of cleaning!) but the Free design really makes grime feel welcome. Its rollerbar tray is wide-open so the user can handle the whole thing. This is convenient, but it can also mean more time spent cleaning – particularly if you work in a grimy environment or often eat at your desk. The Pro rollerbar is a different story. Most of its operating length is enclosed in a plastic cowling, and I’m told it’s quite difficult to work dirt in there. Any crumbs and dust tend to accumulate under the open part of the track instead, and that section can easily be accessed for cleaning with a wadded paper towel. The RollerWave accessory replaces the built-in palm rest. In my view, the default RollerMouse palm rest provides plenty of surface area for parking your hands; however, some users want more. Enter the RollerWave, a snap-on accessory which doubles the depth of the palm rest and makes its slope more gradual. The RollerWave makes the effective total unit depth about six inches, which means that your keyboard will be at least that far away. Personally I like mine a bit closer, but not everyone will feel this way. 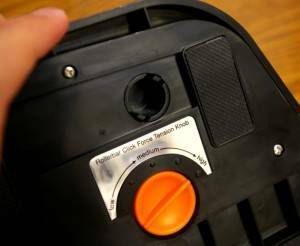 The black circle above the tension control is one of five plastic “posts” that must be undone to change the palm rest. Swapping out the palm rest is no trivial task. There are five hollow plastic posts that must be pushed through from the bottom, and each has two small tabs holding it in place. These tabs are quite tricky. After being squeezed and pushed, they will “catch” again on a seam when the post is about a third of the way through. I realize this is difficult to envision, but you will quickly understand if you ever try it. When I got my sample RollerMouse Pro, I was disappointed to find that it wouldn’t work right with my Kinesis Freestyle ergonomic keyboard. The Pro has a plastic “dock” built onto the back of it, with “wells” designed to receive its keyboard risers. These risers, however, are useless with the uneven footprint of a Freestyle or Goldtouch, and the plastic dock makes it impossible to put the keyboard where it needs to be, as the surface isn’t even. The ErgoMat makes it possible to use configurations like this Kinesis Freestyle and V3 tilt kit setup. Only later did I discover the ErgoMat, yet another RollerMouse Pro accessory available from Contour Design. This is simply a thick rubber mat cut to fit into the aforementioned plastic dock, providing an even surface for ergo keyboards such as the Kinesis Freestyle V3 to sit on. Problem solved… sort of. You see, the ErgoMat I received doesn’t fit quite precisely into the plastic dock, and thus the surface it provides isn’t exactly even. Granted, I’m a rather finicky user, but I can’t believe anyone would enjoy having their keyboard rock and roll while typing. To make my Freestyle V3 level using the ErgoMat, I ended up stuffing something under one foot of the right keying module. I also think the ErgoMat should be wider, as I struggled to arrange my Freestyle on it at the usual width, without having a foot slip off the edge. Overall, the RollerMouse Pro is clunkier than the Free, a bit less accurate, and not as friendly to use. Still, the thicker palm rest and sealed track could be important to some users, and the price point is undeniably a little better with the Pro. It’s definitely an option to consider. Disclosure: This review was made with a complimentary sample from Contour Design.